Guest Author Lisa Genova, Ph.D. I would like to explain how this came to fruition. Hubby and I were having a discussion about the old days, (for the young'ens reading this..a little history lesson) but before the dark age. When Sundays were special and had traditions and rituals. Sunday mornings Church, come home to a big gravy (sauce) cooking on the stove, a big Sunday dinner, then either off to visit relatives/friends or wait for relatives/friends to drop by. We would spend the afternoon sitting around the table, talking, catching up, having coffee, pizza, calzones, etc etc, dessert. And now, how sad, all those traditions are gone. And then I got to thinking, why not have something similar here on my blog. This past year, I have met so many amazing and wonderful people (some I now call friends) through blogging, and how I am in awe of what they do and accomplish. How much respect I have for them, for their honesty, integrity, credibility and so enjoy when a bit of their personality shines through. So every Sunday, here at my place, the coffee will be on, the dessert is on the table and friends will be stopping by. And I will be rolling out the red carpet for my Sunday Shining Star Blogger guest. I was told when I first found this community of book blogging that "book bloggers were the nicest bloggers there are" and I have never forgotten those words. And over the past year, I have truly met the nicest people. I also believe, even though we live behind a screen, a bit of our personality shines through. That is one of the reasons I am having so much fun with this weekly event, and hoping you are too, because we are getting to know those "nicest bloggers" around and about bloggyland a little bit better. This summer has been brutal heat wise, hasn't it? But just think, in a few short months, we will be complaining that it's too cold. I'll take the heat and sitting around the pool with friends over snow. Now if we can only do something about those two grumpy old people....I'm not pointing fingers....I think you all know who I mean.....Men!!! Jeff..make my burger well done please. Steve, I need a frozen banana daiquiri please. ﻿*When and why did you start blogging? I started blogging in July 2009. I needed an outlet for my reading and recommending passion. I was laid off from my job as a bookstore manager a few months prior and was feeling a little lost without that stage to talk to people about books. I was hesitant at first to blog because i didn't think anyone would read it. But now, I may not have 1000s of followers, but i know I have a good solid readership and i am proud of it! 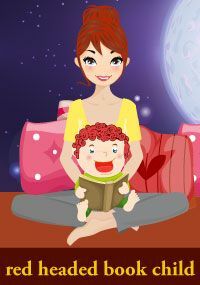 I am a red head and my son, who was a littler guy at that time, was a very BRIGHT red head . We read to him all the time and I thought it was a cute little name. I named it after him. red headed book child He loves books as much as I do! Reviews of all the books I read. I sprinkle in some of my personal life, little stories of my kiddo, weird things that pop in my head but mostly my book reviews. This year i am going to do a monthly book club post that sums up my book club picks and reviews. We are named The Ladies Book Club. That should start this month. I'm also starting to post a few more tales of my life in the literary world; from my career in bookstores, to now working at my local library. Those posts are going to be called Loosely Bound: Tales from my Literary Life. My top 3 favorite genres are LIterary Fiction, Memoirs and Mystery/Thrillers. I enjoy all books but those are the ones that I read the most of and you will only find those genres reviewed on my blog. A few times a week seems to be the norm for me. I am surprised at how quickly the weeks go and sometimes it will be four days and I haven't posted anything. During that time though, I don't feel compelled just to post for the sake of posting. i always try to read other blogs and comment during that time. I would rather have quality over quantity of posts. Gosh, it's hard to say. I haven't had any bad experiences as far as negative comments or authors being mean to me after I review their books, etc etc. I know this has happened to some. I treasure sincerity. So the only thing I can say is it's tough when someone only stops by your blog for a giveaway and that's it. But really, that's silly. It's the nature of us all. who doesn't want free things, right? So, i don't do a lot of those anyway. My point is that I treasure sincere comments and it's only been a few times when I felt some comments weren't sincere or my reviews or posts weren't read. That's really rare. I am fortunate I have amazing, awesome readers who I feel care about what I have to say. I only hope I do the same for you all. I think I mentioned them above too. I will be doing posts for my book club, The Ladies Book Club. I will also be doing Loosely Bound: Tales from my LIterary Life where you will hear some funny stories of author signings I've worked and stuff I've heard managing a bookstore, etc etc. You know, "I'm looking for that blue book. You know, that one" (sigh) There will be lots of fun stories about my adventures in my careers in the literary world! I have enjoyed doing occasional personal posts about my little kiddo, my lack of sleep due to little kiddo, and the fact I had very few friends growing up as a skinny big red haired girl who lived in the country and spent most of her time either in a tree or at the library. Stay true to yourself on your blog and have fun! And be kind. *What draws you to follow someone's blog? I am drawn initially by what they are reading and if they comment on my blog. I always try to follow up with my comments and respond and follow those blogs. I look at the profiles too and their history, likes and whatnot. And sometimes, I like pretty pictures and if it's a shiny happy blog full of bells and whistles, sometimes I am easily amused and click that darn follow button! *Do you have any "pet peeves" that other bloggers do? Hmmm...not really. Your blog is your own. Do whatever the heck you want. Just please don't blast me or other bloggers. Be kind, once again! I am a huge fan of Jackie Collins. I am addicted to soy lattes and may need to seek therapy for it. One day i would really love a farm with a pick up truck and cute farm hands to help me with chores. And my husband, of course. I have really pointy incisor teeth that make me look like a vampire and I enjoy scaring the children I work with. he he. All in good fun, no worries. I had open heart surgery when I was 5. I sing a lot and am addicted to musicals and GLEE! Oh and I think I am waaay funnier than I really am. It would make me really happy if I hit 300 followers this year. There is just something really cool sounding about 300...maybe because I really liked that movie with Gerard Butler. Yes, that's it. Michelle, thank you for being my guest today and sharing yourself with us all. Once again, as you can see from her answers, book bloggers are definitely the kindest, nicest, caring bloggers in bloggy land. A wife, a loving and devoted mom, a down to earth person, a self proclaimed comic lol, and a girl who has faced some major health problems, I think you will all agree, Michelle is a SHIINING STAR!!! A perfect Shining Star!!!! I love Michelle and her blog!!!! Brought some brats for the cookout today but while you swim, I am going to be unsociable today and read and watch the race. Darn meds meds don't let me have my usual beverage, which makes me worse than those grumpy old men today. Hopefully next week we'll have some fun!!!! I enjoy Michelle's blog also, and visit often. 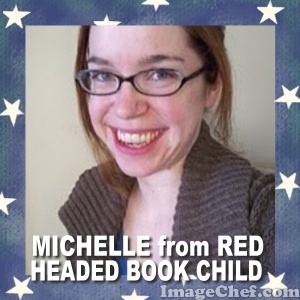 Congratulations, Michelle, you are a Shining Red Star in my book. It is so nice to meet Michelle today! Love Michelle's blog! And her Mystery Author Challenge ('cuz y'all know I love me a good challenge)! Yay for Michelle! Yaaaay Michelle is one of my favorites especially in the mystery/thriller genre. I get hives too :-( I have it more controlled now though. I love her avatar - it's so cute! Pleased to meet such a fun mom and Yes - I love Glee and Gerard Butler! Red-headed Michelle...one of my favorites! And we share a name. =O) All joking aside, I enjoy reading Michelle's blog and interacting with her on Facebook. She always has something funny to say and she may just be funnier than she thinks she is. ;O) We also have Glee and Gerard Butler in common....and the singing! Great to find out more about your Michelle. I am already a follower and love your Ladies Book Club updates. Thanks for having me!! It was really fun!!! I appreciate all of you stopping by and reading about little ol' me! That was awesome Michelle. You are the sweetest. I loved your advice about being kind. I hope you reach your 300. You SO deserve it! PSsst you started the same summer I did. Girl, how did I not know you loved GLEE?! I listen to my Glee soundtracks nonstop! I love that you scare the kids with your teeth too! Hahaha!